The connexion between the auricle and ventricle is never a single muscular fibre but always a number of fibres, and although these are ordinarily in physiological continuity, yet it is conceivable that exceptionally, as after too rapid stimulation, different parts of the bundle should lose their intimate connexion A slight difference in the rate of recovery of two divisions of the A-V connexion might determine that an extrasystole of the ventricle, provoked by a stimulus applied to the ventricle shortly after activity of the A-V connexion, should spread up to the auricle by that part of the A-V connexion having the quicker recovery process and not by the other part. In such a case, when the auricle became excited by this impulse, the other portion of the A-V connexion would be ready to take up transmission again back to the ventricle. Provided the transmission in each direction was slow, the chamber at either end would be ready to respond (its refractory period being short) and thus the condition once established would tend to continue, unless upset by the interpolation of a premature systole. One could not wish for a more beautiful description of AV nodal re-entry, and it is sobering to realize that upsetting AV nodal re-entry by "premature systoles" was accomplished in patients 54 years later (Coumel et al. 1967) and 58 years later in isolated rabbit heart preparations (Janse et al. 1971). In both papers, as well as in an earlier paper on AV nodal re-entry (Moe and Mendez 1966), proper credit was given to Mines. Figure 10 shows microelectrode recordings from an isolated rabbit heart preparation in which AV nodal re-entry could be induced and terminated by premature atrial stimuli. One cell (N2) belongs to the anterograde pathway, the other (N1) to the retrograde pathway. During the tachycardia, the stimulator on the atrium was switched on and accidentally the regular stimuli captured the atrium, resulting in a "premature" atrial impulse. In panel a, the premature impulse excited N2 in the anterograde pathway prematurely (open circle in the diagram) and reached N1 in the retrograde pathway almost simultaneously with the retrograde "tachycardia" wavefront coming up from the node. The tachycardia was merely reset. In panel b, a slightly earlier atrial impulse failed to elicit an action potential in the anterograde path, but entered the retrograde path to collide with the circulating wavefront, terminating the tachycardia. 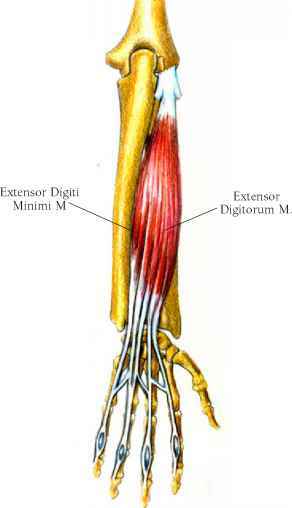 This is what Mines meant by upsetting the reciprocal rhythm by the interpolation of extrasystoles. 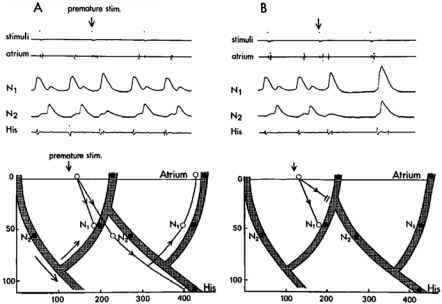 Figure 10 also illustrates what Mines wrote about the different fibres being "ordinarily in physiological continuity..." unless "... after too rapid stimulation, different parts of the bundle should lose their intimate connection " When following termination of the tachycardia in panel b the atrial stimulus causes normal conduction from atrium to His bundle, N1 and N2 are activated almost simultaneously. During the tachycardia, both action potentials show an electrotonic component coinciding with the "active" component of the other action potential, indicating loss of "intimate connection". The fact that during this loss of intimate connection, or, as we would call it now, longitudinal dissociation, there is still electrotonic contact between the two pathways means that the pathways are very close together. It would seem foolish to attempt, at least in this part of the node (the so-called compact node) to cut through one pathway to abolish re-entry, since one would certainly damage the other pathway as well, causing AV nodal block. Although all authors working on AV nodal re-entry agree that the lower level of the junction between anterograde and retrograde pathway is above the level of the His bundle, controversy has existed regarding the question whether the atrium forms part of the re-entrant circuit, or whether the circuit is entirely confined to the node itself. The fact that it is possible, both by surgery and by catheter ablation, to abolish AV nodal re-entry by destroying tissue far away from the compact node whilst preserving AV conduction seems clear evidence that the atrium must be involved in the circuit (Marquez-Montez et al. 1983; Ross et al. 1985; Coxet al. 1987; Haissaguerre et al. 1989; Epstein et al. 1989). The reason why these therapeutic interventions were attempted was that both in animals and in humans the atrial inputs to the AV node during AV conduction, and the exits during ventriculo-atrial conduction are far apart, superior and inferior to the ostium of the coronary sinus (Janse 1969; Sung et al. 1981). We therefore seem to have a very satisfactory and logical sequence of milestones on the road from understanding the mechanism of an arrhythmia to its successful therapy: Mines' description in 1913, microelectrode studies in animal preparations in the 1960s and 1970s, experimental and clinical demonstration of termination of the tachycardia by premature stimuli, demonstration of atrial input and exit sites to and from the AV node that are wide apart, successful surgery in the 1980s and finally catheter ablation with success rates that approach 99% and with complication rates well below 1% (Strickberger and Morady 2000). Clearly, this is a success story. Paradoxically, whereas in AV re-entry, understanding of the mechanism of the arrhythmia and therapy go hand in hand, in AV nodal re-entry we still are in doubt about the exact location of the re-entrant circuit. For example, in the canine heart the re-entrant circuit during ventricular and atrial echo beats is confined to the compact AV node, and regions immediately adjacent to it, and atrial tissue is not involved (Loh et al. 2003). It is of course possible that circuits involved in echo beats are not the same as those responsible for sustained tachycardias, but it is also possible that radiofrequency ablation of sites far from the compact node alter input sites and/or innervation of the compact node without actually interrupting parts of the re-entrant circuit. To quote Zipes (2000), who borrowed the words Churchill used to characterize Russia, the AV node is "a riddle wrapped in a mystery inside an enigma". Is brugada a re entrant tacycardiabrugada?